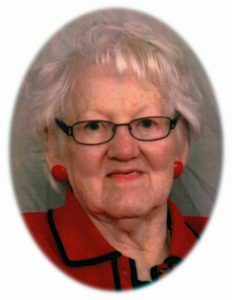 Lillian A. Swatek, 96, died peacefully Monday, July 3, 2017 at her Ellen’s Home residence in Port Washington, Wisconsin. She was born July 13, 1920 in Port Washington, Wisconsin to Michael and Susan Roller Burton. She met John ”Jack” Ternes of Port Washington and they were married May 26, 1945 at St. Mary’s Church in Port Washington. She worked at Harry’s Restaurant and later helped run the Columbia Tap with Jack. He preceded her in death August 31, 1953. Lillian continued to run the tavern and married Frederick “Fritz” Swatek on January 15, 1955 also at St. Mary’s Church. Shortly after her marriage to Fritz they built their house on Grand Avenue in Port Washington. She took a job as a receptionist for the Ozaukee Press for 4 years before becoming a secretary at Port Washington High School. After 17 years she retired in 1984 with more fond memories than she could count. Fritz preceded her in death June 27, 2008. Through the years Lillian was active at St. Mary’s Church baking with the Christian Mothers and making mittens for missions. She also volunteered at the Port Washington Food Pantry and enjoyed spending time at the Port Washington Senior Center. She liked to sew, play sheepshead and bridge, bowl and golf. Wherever she went she made friends easily. She is survived by her daughters Diane (Stan) Mountford of Hollister, California and Mary Jo Johnson of Milwaukee, Wisconsin; grandson Kaleb Johnson and great grandchildren Lillyanna and Owen all of Milwaukee. Further survived by other relatives and friends. She is preceded by her husbands John “Jack” Ternes and Frederick “Fritz” Swatek, her brothers Harry Burton and Robert Burton, her sisters Ester Miller, Julia Buczek and Caroline Miller and a sister-in-law Mabel Burton. The Reverend Don Zerkel will celebrate Mass 6 pm Thursday, July 13, 2017 at St. John XXIII Parish, St. Mary’s Church, 430 N. Johnson Street, Port Washington. Visitation 4- 6pm Thursday AT CHURCH with a rosary at 4 pm. Memorials to Ellen’s Home appreciated. POOLE FUNERAL HOME/Crematory, Port Washington assisting the family. Information and condolences at poolefh.com or 262/284-4431. Condolences & best regards to Mary Jo & Diane. Always appreciated the wonderful neighbors you all were! Prayers to her family🙏🏼 I had my high school co-op job with her–such a beautiful lady.